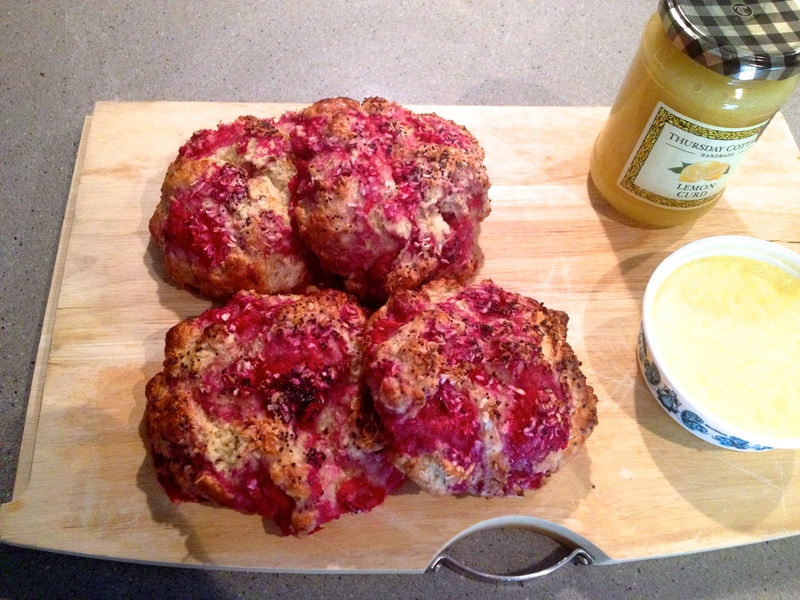 Treat: rasberry & coconut scones with lemon curd and clotted cream – Hello… Is It Me You're Cooking For? Hello… Is It Me You're Cooking For? It’s Sunday. It’s a bit drizzly outside and I fancied making something to accompany a cup of tea and a book. So I went for a traditional cream tea with a tropical summery twist. It’s sweet and sharp all at once. These are delicious and taste amazing with lemon curd and clotted cream. Mix the flour, coconut, baking powder and bi-carb together in a mixing bowl until combined. Cut the cold butter into small cubes and crumble into the flour mix with your hands, rubbing it altogether until it becomes a small breadcrumb-like mixture. With a knife stir the mixture slowly until it forms a sticky dough. If it’s too dry add another tbsp of milk. Tip in the rasberries and gently fold them into the dough. Try not to break them up too much – which is why freezing them is a good plan beforehand. Tip the dough out onto a floured surface and round into a ball. Divide the ball of dough into four smaller balls and place evenly spaced out across a baking tray lined with grease-proof paper. Beat the egg and brush over the top of the scones, scattering the poppy seeds and coconut over the top. Bake for 15 mins until puffy and slightly browned on top. Serve with lemon curd and clotted cream.